A vintage black and white Sankey diagram for an efficient wind park is shown in this post on the Hypergeometric blog aka ‘667 per cm’ blog. Out of the several Sankey diagrams shown, this one was new to me. So I dug a little deeper into the original source. Published originally in: Koroneos, Christopher & Katopodi, E. (2011). 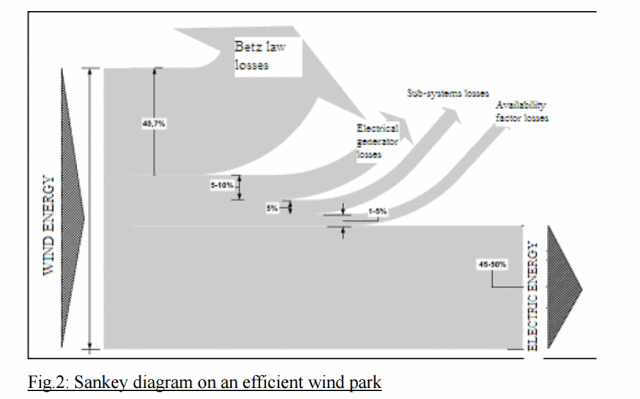 Maximization of wind energy penetration with the use of H2 production — An exergy approach. Renewable and Sustainable Energy Reviews. 15. 648-656. 10.1016/j.rser.2010.06.022. The authors from Aristotle University of Thessaloniki, Greece argue that Sankey diagrams can also be used to visualize exergy ﬂows, and that they can be used to compare “exergy losses of an efﬁcient and an unefﬁcient wind park”. The one above has “an excellent exploitation of wind energy for an organised park that operates efﬁciently and effectively”. They further discuss what factors contribute to losses based on an exergy analysis, and show several exergy Sankey diagrams.